Here is a puzzle. Time to wash the bee suit. I am lucky enough to have two (thought it a good idea to keep one for home and one away but also perhaps, for different circumstances such as visitors). The second was an all in one – it was in some ways an extravagance given the earlier Thornes purchase. 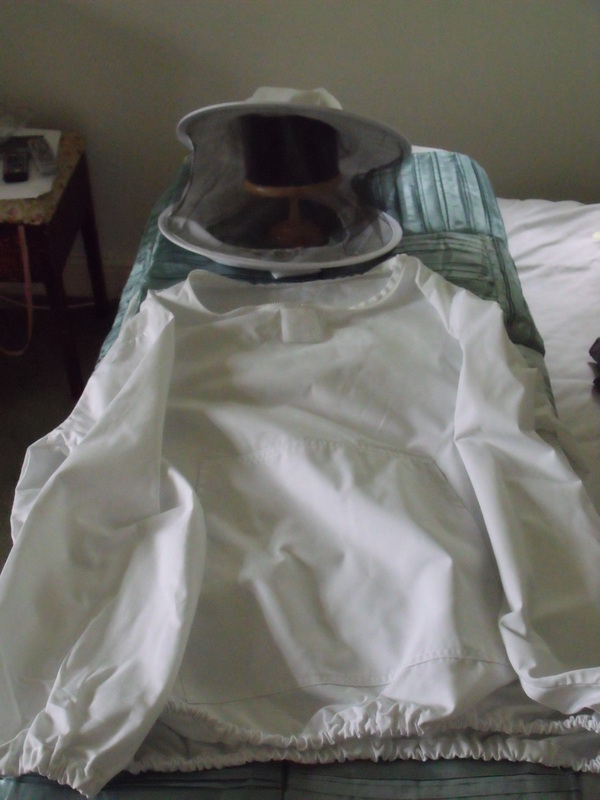 I had lusted after an all in one preferably not white when I’d seen other bee keepers with them. I also find the sort of all the way through muff style pocket at the front of the Thornes jacket a little silly. It is all too easy for things to fall out as the bottom of the pocket is level with the openings and either way you lean things could come out. It was only when I saw BeeBasic really does seem to know how to ‘take the sting out of beekeeping’ that I thought I could justify the expense. Having reread some of the threads I managed to remove the hat from my Thornes jacket (the key to this is to move both of the moving zip parts to the correct end where the two pieces can then be moved off the end leaving hat and veil separate from the remainder). The Bee Basic all in one has defeated me though to be fair, it came with instructions for washing which I have mislaid. I am sure that either I am missing something obvious OR it can be safely washed in one piece. Just too frightened to risk that. The other option might be to tie a pillowcase around the hood part. I ought to write to BeeBasic. I am sure they will be helpful! Update: My certainty that BeeBasic would be helpful has certainly been met and exceeded. As it is Sunday I never dreamt I’d have a reply before Monday – but I have had a helpful one and a little perseverence and I succeeded. I think I was just being a little too gentle! They explained that with great patience and I’ll share it here in case anyone else has trouble. I also think the speed (just over an hour around lunchtime on a Sunday!) and nice tone of their reply endorses all my previous good impressions of them. Your method is right and the hood should have come off. Both carriages need to be at the end of the zip where there are the long toothless ‘rests’. Holding the carriages firmly so that they do not engage with the teeth, slide the zip apart through the carriages. It is like undoing a zipped jacket. Some zips almost fall apart. Others may take a little persuasion. Be firm but not excessive. We have never yet had a hood that did not come off. 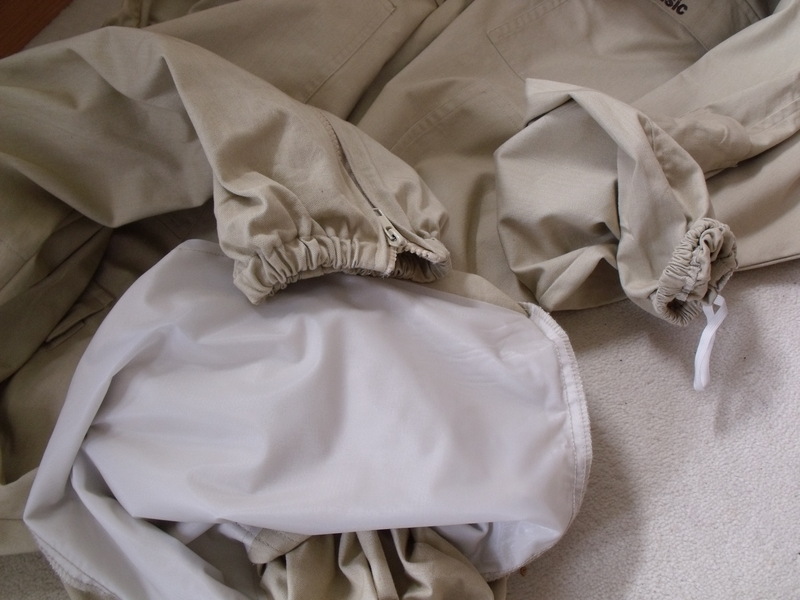 So, my second suit is now humming away in the washing machine. I might try out the embroidery setting on my sewing machine over winter. A nice honey bee and my name somewhere on each. Both suits have washed well. All in one suit showing zipped leg end, lined knees and wrist with elastic loop. Can I re-attach the hoods? Yes, and quite quickly. 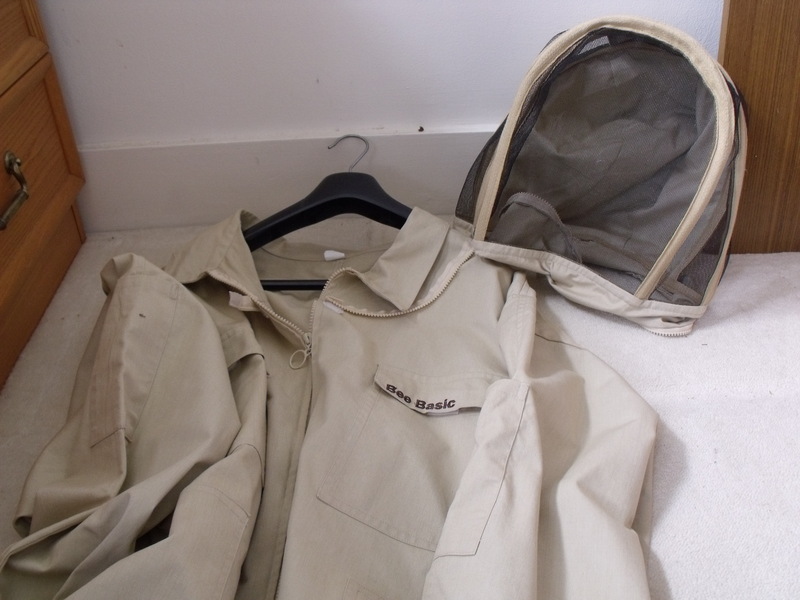 7 Responses to How Do You… wash your bee suit? Thank you soooooooo much, could not figure out how to get the hood off, you have saved he day and suit it not in the washing machine!!! I don’t think you are alone, Paul, as this is one of the most visited page and the searches that got people there echo similar desperation! Have you come across the beekeepers forum? I find they can answer lots of my questions quickly – though you may get loads of contradictory advice you can at least weigh it up and choose one. Happy beekeeping. Let us hope for more honey this year. Thank you very much, saved the day! We have got the hoods off but it is a complete mystery as to how to put them back on. ~there are two zips pieces. Use a safety pin the side that the slider ended up to help but sometimes it is trial and error. If you buy from some suppliers, hoods can mix and match.